August 08, 2016, 4:20 p.m. Despite the runaway success of the UK Independence Party – with 4 million votes at the 2015 general election and a Brexit vote at the EU referendum – the majority of voters don’t believe that the party will spend much longer as a force in British politics. 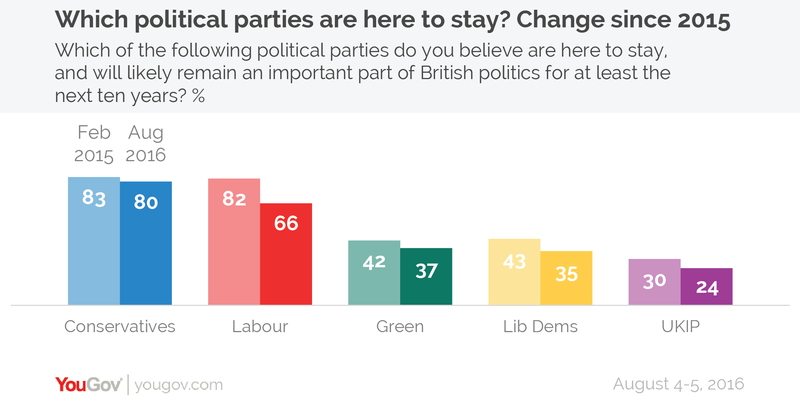 More than half of voters (55%) believe that UKIP will not be important in British politics in ten years’ time. This belief extends across the entirety of society, with the only group of people more likely to believe that the party will be important a decade from now being those who voted UKIP in 2015. Despite the warnings of some Labour politicians, the majority of the public are optimistic about Labour’s survival, with 66% believing that Labour will still be a major force in ten years versus 13% who think the party will have faded. The current turmoil within the Labour party does seem to be affecting public perceptions though. When asked the same question in February 2015, 82% of people said that the Labour party would still be important in ten years, meaning that belief in the continued importance of Labour has dropped 16 points in 16 months. On top of this, Labour voters in 2015 are actually more likely to think that the Conservatives will survive the next ten years (84%) than their own party, Labour (79%). By contrast, the number of people who think that the other mainstay of British politics – the Conservative party – will still be a major force in ten years has remained relatively stable at 80%, against a mere 3% who do not. 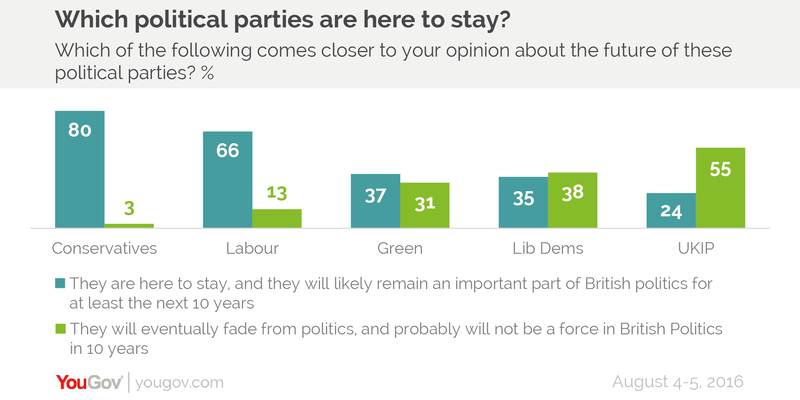 Aside from Labour and the Conservatives, the only other party we asked about that people overall thought would be important in ten years’ time were the Greens. Opinion here was split though, with more Northerners, old people, Leave voters and voters for right wing parties in 2015 – groups among which the Greens perform poorly – all noticeably more likely to think the Greens will fade over the next ten years. Despite having been a party of government little more than a year ago, more people believe that the Lib Dems will not be important in ten years (38%) than think they will be important (35%). Having barely survived in Parliament through much of the post-war era (as the Liberals), the Lib Dems may have to prepare themselves for another extended rough patch.